This might be my favorite combination ever!! 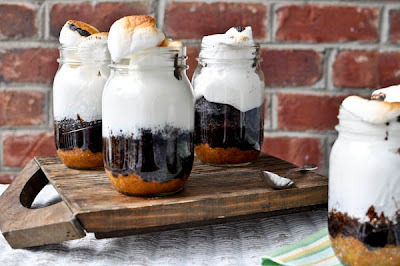 You know I love s'mores and you know I am obsessed with food served in jars. This is a beautiful combination of both from How Sweet It Is. I think they would be a great way to bring you down from your Memorial Day weekend food comma. Okay, probably not, but at least the kids don't have to go to school tomorrow! Unless they aren't out for the summer yet. So if that is the case save these as a way to celebrate the first day of Summer vacation. Or if you aren't excited about summer vacation, use it to drown your misery. Is that enough excuses for you to try it? Good. and again you have me licking my screen. Wow, those look delicious!